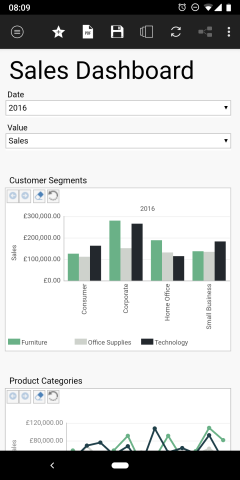 Dashboard sheets are available under the Visualise group in the XLCubed Ribbon. The creates a new sheet in the workbook and opens the Dashboard Ribbon. Grids, Small Multiples, TreeMaps, Maps, Viewports or Slicers can be added from this ribbon (or alternatively use the normal XLCubed ribbon) and set up in exactly the same way as when inserting them on a standard Excel sheet. When an object is added to the dashboard it will be positioned starting at the active 'cell' in the dashboard and can then be re-positioned and sized as required. Design Mode: XLCubed Dashboards have a design mode and a runtime mode which is toggled through the Design Mode button on the Dashboard ribbon. Zoom: Zoom in on an object to make it fill the screen and hide all other dashboard objects. Selecting zoom again reverts this action. 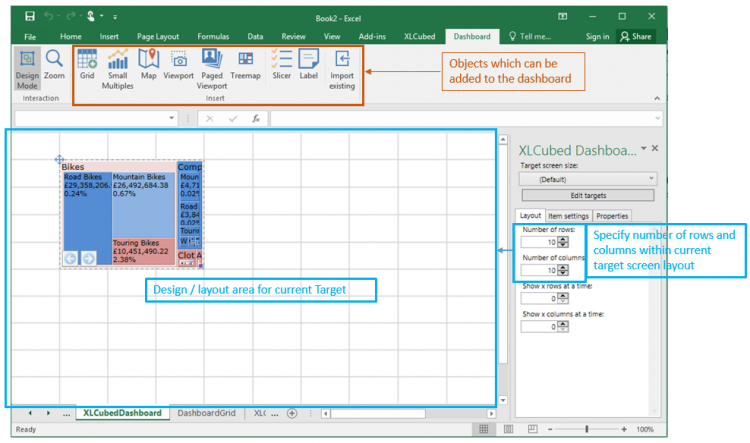 Import Existing: Allows for the import of existing XLCubed objects within the current workbook onto the Dashboard sheet. The layout, item settings and properties of the dashboard are controlled in the dashboard taskpane which is automatically visible when in design mode. Adjust the number of rows and columns in the dashboard. You can also control how many rows/columns are visible if you require the dashboard to be scrollable. See Targets for more detail. Here you can see all the items on the dashboard and control their visibility (some items could be visible in one target but not another). The names of each item are set in their individual properties. You can set a border for each item. Set the dashboard background colour. 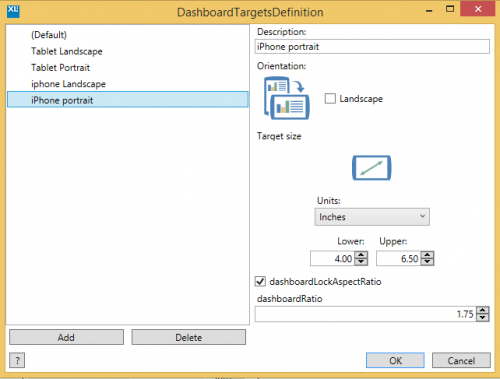 Targets are categorisations of the display size which the dashboard can be viewed on. This allows for different layouts of the same dashboard to be defined based to best fit the available screen size. The concept is that the dashboard itself is developed once, and can then be layout optimised per device type. A new Target can be added in the dialog below. You must specify the lower and upper range of diagonal screen size which you want the target layout to be applied to, and also if portrait or landscape. You can also specify the aspect ratio to ensure that when objects are being dynamically resized this is taken into account. Each Target frame has a number of rows and columns which can be varied as required, and the objects on the dashboard arranged as desired within the available matrix. To optimise a dashboard for a smartphone in portrait mode it's likely that the best fit will be to have all the objects arranged vertically, and to restrict the view to 2 or 3 objects on the screen at once. To achieve that you would add a new Target with (for example) 1 column and 6 rows. Each resulting cell would contain one dashboard object, and "Show x Rows at a time" would be set to 3. This means the phone user would swipe up to see the second set of 3 objects within the dashboard. Categories control how the objects on a dashboard are linked together. By default every object added to a dashboard is linked to all the other objects. For example when a Grid is added to a dashboard already containing a slicer, the grid is automatically linked to the slicer and will update based on slicer selections. Similarly when a small Multiple or Treemap is added, they are auto-linked to the other objects. Initially everything will be linked together on the red category. To view the categories, click on any object on the dashboard and the current category is shown on the top right, signified by a colour. The default and initial colour is red as shown below on the Date Calendar slicer. Clicking on the Red category square shows other available categories, and hovering over the colour will highlight all other dashboard items in the same category. By default all objects will be linked together on the Red category. To remove a link between two objects, simply unselect the category in the required object. Below shows that the red category has been removed from the Grid, and replaced by blue. The Date slicer has both Red and Blue Categories selected, so it will still link to the Grid, whereas the Values slicer has only Red selected so will not affect the Grid. The automatically generated links will show within the designer for the individual objects as ‘Dashboard Selection’ as shown below. This can be amended to show children, or descendants at a level as needed. Dashboard labels allow you to add text to a dashboard sheet. 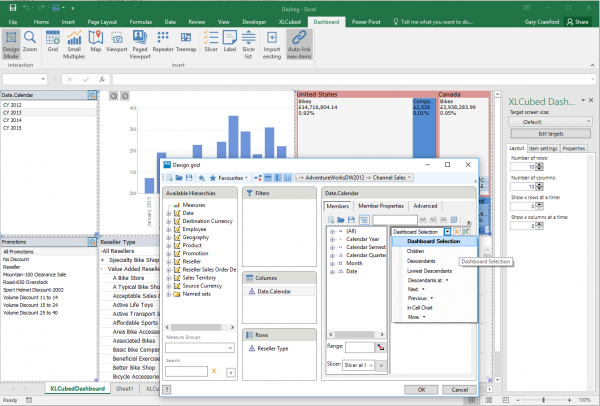 This text can be entered directly, copied and pasted from a highly formatted source, such as Word, or reference the contents of an Excel cell. Colours: Set the font colour, text background colour, and label background colour. Font size: Set the font to a fixed size, or auto size text to fit the size of the label. Alignment: Align text both horizontally and vertically within the label. This page was last modified on 2 April 2019, at 10:26.